Built in about 1995, this model represents Lotus’ entry at the 1971 British Grand Prix. The car finished 3rd, one of Emerson’s better results that year. 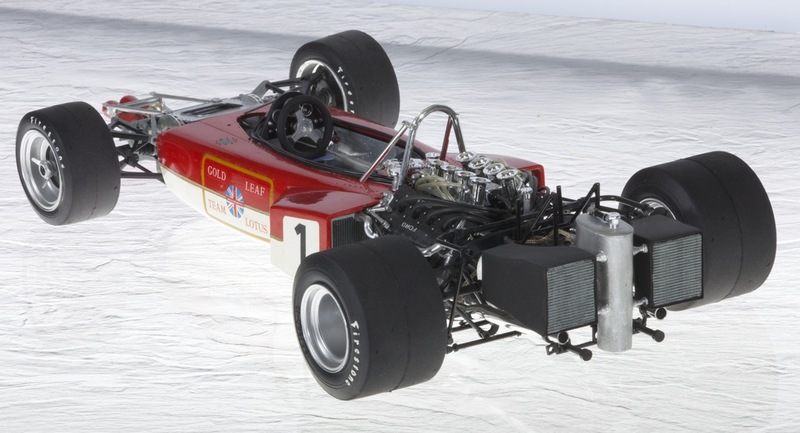 This was a Lotus 72D, a variant which was identifiable by merit of parallel rear suspension twin radius rods which appeared on the car at Monaco. Improvements and changes were constantly being tried including a switch to Koni dampers at Barcellona (Montjuich Park) which spectacularly improved the car. These were mounted outboard and inclined at the rear keeping them cooler than their predecessors. A rudimentary airbox appeared above the engine which replaced the side intake version seen in some earlier Grands Prix. The nosecone now lacked its familiar NACA ducts in place of exit chimneys for brake disc cooling and these regular changes in a setting of lower profile Firestone rubber often causing vibration, enabled lotus to build a database on which to launch their very successful 1972 car which won many Grands prix and the Championship. Fittipaldi, a newcomer, having won his maiden Grand Prix at Watkins Glen in his first year (1970) had a relatively quieter learning year in 1971, not helped by a road car accident which kept him out of the cockpit for a while mid-season. Lotus were also bound to be side-tracked by their having to concentrate on and run a second car from time to time, the Lotus 56B. 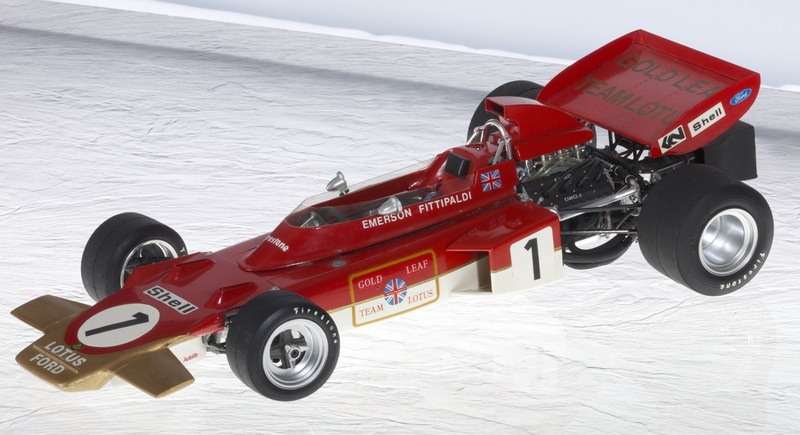 This was a model built as a conversion from a standard Tamiya 1972 Lotus 72D to the car which preceded it in 1971. Not necessarily as good looking, especially after my brush-painted effort in 1993. However, it was exciting to bring about a model of a car that no one else would have and to have to make scratch-built parts such as the rear oil tank and coolers. Interestingly, these were made from stiff shiny card found within an estate agent’s brochure, glued with superglue, sanded and painted; amazing when I look back on it. A deeper windscreen, altered front winglet shape, additional fire-extinguisher and transverse battery on the monocoque floor under the driver’s knees and new airbox (possibly paper card too) were all part of the challenge, as were decals which are not all that accurate (those on the flanks are from a Lotus 49B kit and are not large enough I suspect). The GLTL decals on the modified rear wing were the best fit I could find from Letraset as I recall, but size and font may well be found wanting. 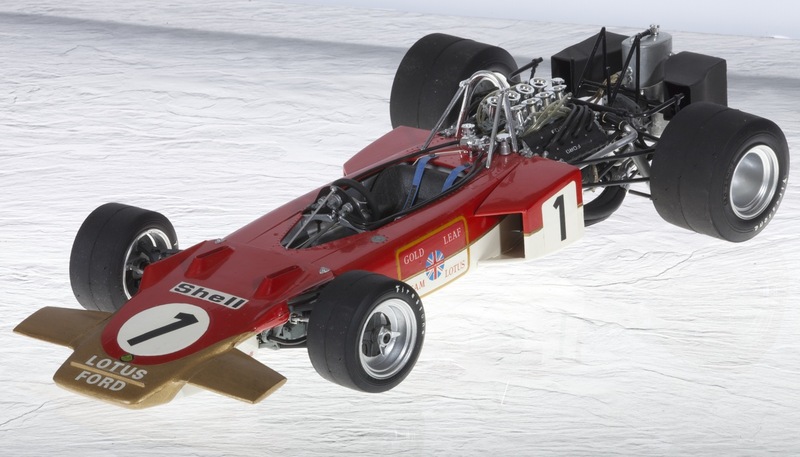 Apart from its potential if I were to remake the model, I’m not sure if there’s much more to commend it, especially as 1971 was such a trying year for Lotus, without a single Grand Prix win. 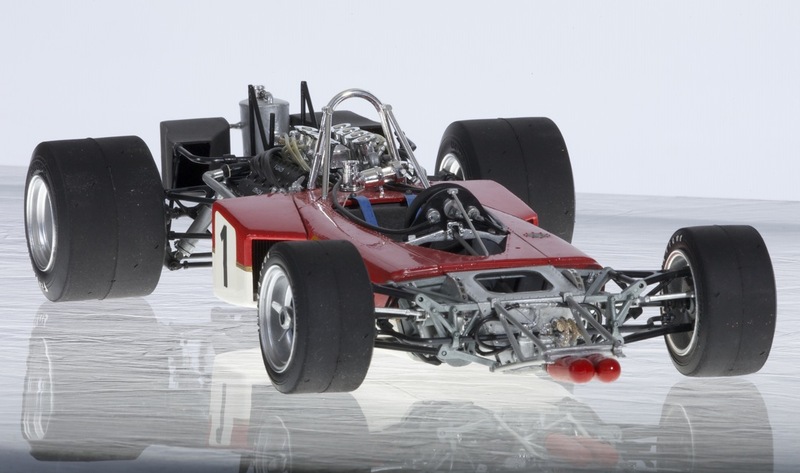 I have had longterm designs on the model to perhaps rebuild it one day as a 1973 car incorporating the deformable regulations. I have seen this done before at an IPMS show in Telford some ten year ago or more, but it would be difficult to match that superb effort. Apart from the obvious changes to bring about the 1971 car, I’m not sure there was much super-detailing applied to this model apart from that associated with the oil tank/coolers, seat belts and jubilee clips on the water hoses.